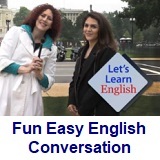 ﻿ Fun Easy English - new classroom free online classes english language lessons speaking listening writing reading february 12. Today in the classroom you are going to learn some idioms beginning with the letter A. Today learn idioms beginning with the letter A. 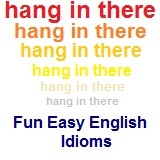 This idiom is used most often when referring to someone who is late in doing something. It's about time you showed up (arrived), the food is getting cold.